This shows that not only are Optical Discs far more efficient for long term archival data storage, but also reduces the overall expense of operating the device, saving the company money as well as their critical data. In addition, it shows that optical discs are still very relevant and that those touting the death of optical media are sorely mistaken. For more details about Vinpowerâ€™s array of archival media and duplication hardware, visit our website or contact a Vinpower representative near you. 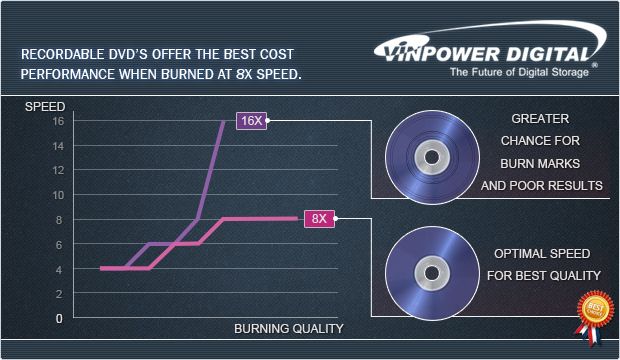 Recordable DVDâ€™s offer the best cost performance when burned at 8x speed. Just as the tortoise proved that slow and steady wins the race, so true is the case when burning DVDâ€™s. When selecting the most productive recording speed, 8x provides the best cost performance in terms of speed and recording quality compared to any other option. Sure you could burn the DVD at 16x speed, but for the 16x designation could be confusing. Burning at 16x is not twice as fast as 8x, in fact, you may only save roughly 60 seconds, but at that higher speed, youâ€™re more likely to see visible burn marks on the bottom of the discs that look like donuts. Those burn marks could negatively affect the playback or could even cause the drives to fail the disc during the duplication process. Make sure you donâ€™t sacrifice quality for just a slight advantage in speed. In fact when you visit the major duplication houses around the world, which make their living duplicating discs, and youâ€™ll see that they prefer to burn at 8x every time. For more details about the optimal burning performance, contact Vinpower Digital or an authorized Vinpower representative. The manufacturing process for optical discs, especially recordable DVDâ€™s, is fairly standard. You start by designing and creating the stamper. Then create the substrate through injection molding and spin coating to create the recording layer of organic dye. Next perform the sputtering for the reflective layer and another spin coating for the protective layer. Finally, you bond the disc together with a dummy substrate of polycarbonate. Sounds simple enough, so what makes the Optodisc DVDâ€™s better than other comparable recordable DVD’s? The answer is simple, when Optodisc media are being produced, there is great attention paid to every aspect in the manufacturing process. Starting with the stamper, Optodisc makes sure that the stamper is designed expertly and that the substrate, reflective layer, and sputtering are all applied with the goal of making a better disc rather than cutting corners to save a little on the overall cost. 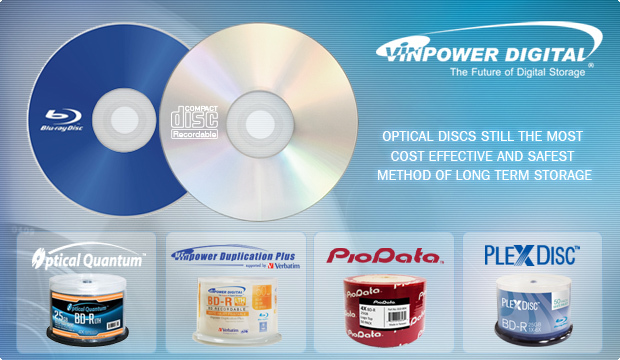 Optodisc DVDâ€™s are created in a method that ensures stable consistent quality and reliability for years. If you want to save money and not give up quality, then Optodisc is the best option for you. Contact Vinpower Digital or a Vinpower representative for more details about the full line of Optodisc media.